Happy Halloween!! Today is the day to eat as much candy as you want with no regrets. So what if there’s nothing left but wrappers for the trick-or-treaters? Tricks are good too. complete Steampunk Fantasy novel – all four parts of the serial in one volume! Just when Raven decides to give up on her life as an assassin, she’s pulled right back in. RAVEN STEELE COUNTED every footstep she chanced through New Haven with the knowledge that any could be her last. But the gamble wouldn’t last long. She quickened her pace. Only two kilometers of brownstone street stood between her and the safety of the forest. A throng crowded the street. People. Men. Women and children. It had become too easy to think of them as cattle. But they were human. Her deepest desire was to become one of them and live a normal human life. Gregory would make her feel human; he always did. Her heart quickened at the thought of him, and her tread became light. Raven winked at a fat-cheeked baby held by a pinch-faced woman with silver hair pulled into a severe bun. The woman looked Raven up and down, tching her tongue and shaking her head. Even in the city, a woman in breeches instead of a skirt remained unacceptable. Or maybe the crossbow snapped to the magnets on the back of her corset made the difference. Would the woman know her secret? Raven swallowed hard and assured herself of the ignorance of the populace. Few knew what a reaper was, much less their prohibition from the city. The scraping metal and shouting continued down the street, scattering merchants who gave the coach malicious looks and then checked their wares for damage. Beside her, a bronze clockwork mechanical man pushed a merchant’s cart, its jerky movements unsuitable for zeppelin-living high society. It stopped just before the haberdasher’s shop. He placed the gadget next to a pile of potatoes, and the clicking and whirring of the blades set the crowd into exclamations of eager yearning. The people applauded and mobbed the stand, blocking the entire walkway. No elbowing through the throng this time. 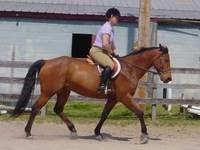 With a sigh, Raven hopped off the walk onto the street, nearly stepping into a pile of manure left by a flesh horse. Her metal-heeled boots clicked with each step on the smooth stones. Seagulls crowded a fishmonger’s cart on the other side of the street. The monger accosted her as she neared the bridge, but quickly moved on to the next person behind her when she shook her head. Boats docked behind him and bobbed up and down in the river. Skipping up the steps of the footbridge, she pushed away a black flyaway curl from her eyes and pulled the tendril behind her ear. Halfway across the bridge, she inhaled a lungful of the salty air and released a contented sigh. Only a day’s journey still stood between her and Gregory’s house, and for once, she wasn’t injured. She smiled to herself as she imagined the look of surprise on his face. She planned to tell him she loved him this time. Butterflies fluttered in her stomach. Would he be ready for marriage? Was she? The fishmonger’s scream broke through the chattering crowd on the bridge. He jumped into the river to avoid an out-of-control carriage pulled by a polished brass automated horse. Steam poured from the nostrils of the metal horse and leaked from its joints in an unnatural manner. Its black lacquer carriage careened on two wheels through the turn onto the bridge before righting itself. Wires shot out of the neck of the metal coachman where the head should have been. The reins in its limp, useless hands were slack and whipping against the horse’s metal flank. Raven jumped to the rail, moving out of the way of the crowd as they stampeded toward her. She gripped the lamppost and her reaper training kicked in. No fear. Breathe deeply. Think ahead. Make quick decisions. The black lacquer carriage squeezed between the bridge railings, and the oak boards of the narrow footbridge splintered apart as though they were balsa wood. The railing to the left gave free another meter and the automated horse jerked in that direction. In a quick, natural motion, Raven unsnapped her crossbow and felt through the quiver attached at her thigh for the right bolt. Pulling the wire from her belt’s winch, she hooked it to the arrow, pointed it at the wooden post of the gas lamp standing closest to the carriage, and pulled the trigger. For a moment, the heavy metal horse hung over the edge with the carriage wedged between portions of broken railing. The horse’s brass legs still poured steam as they struggled in the air, creating the eerie sound of scraping metal. Gouges raked along the black side of the carriage as it inched its way toward the river. A small hand pressed against the window. The door surged past the railing and swung open. The body of a young boy tumbled out. He hung from the door handle with his fingertips. A gasp and a few screams filled the air behind her. Adrenaline coursed through her veins, and Raven leapt toward the boy—toward the river. She fell in a controlled arc, the wind pulling her long hair as taut as the line from her belt. The carriage broke free from the bridge a moment before she reached it. She thumbed her winch to release more line and grabbed the boy in a full embrace. The cold water enveloped them. The sudden change in temperature forced the air from her lungs, but she held it in as they darted below the surface. Her submerged body jerked to a stop as the line reached an end. The boy’s forehead struck her in the temple. Saltwater burned her eyes, and stars danced in her vision. Bubbles of air escaped her lips. The boy went limp in her arms. She gripped him tightly in one arm and hit the rewind lever on the winch. She grabbed the line, and it wrenched her toward the light above. Streaks of her long, black hair stuck to her face as she emerged from the river. She released her breath and gripped the line. The winch pulled her toward the bridge, and the crowd above applauded. Gasping, Raven struggled with the sudden, heavier weight of the boy, struggling to hold him until they reached the top of the bridge. The line cut into her hand and her arm muscles ached. Her tall black boots squished against the side of the bridge as they were pulled steadily up. She pushed off a tarred pylon to make it over the lip before the cable pulled them against the railing. The winch slowed when it neared the top. She reached up with her free hand and grabbed the crossbow bolt. With a flick of her thumb, she depressed the lever and the grappling hooks withdrew. After pulling the hook free of her line, she replaced the bolt in her quiver. A slow zipping sound continued as the winch on her belt drew in the cable. She allowed hands from the crowd pull the boy from her grasp. She blinked the saltwater from her eyes, her vision still blurred, her muscles quivering. Four armed guards and one skinny man in a bowtie surrounded the boy she’d hauled to the surface, shooing away the people. Two other guards stepped forward to hold back the crowd. With a sputter and a cough, the boy retched water from his lungs. The tension in Raven’s chest relaxed. She smiled and attempted to step toward him, but a vice-like grip took hold of her arm. Her fingertips twitched; she was ready to grab the knife on her hip and fight her way out, if necessary. The hard faces of two guards stared down at her. She could smack one in the jaw with the back of her head, and when he loosened his grip, throw a punch at the other. The taste of escape grew bitter on her tongue when she considered the surrounding crowd. She made a count of the collateral damage and clenched her jaw. The last thing she needed were more kills on her conscience, more lives to redeem herself for. With a deep sigh, she remained still. In simple language, Pauline Creeden creates worlds that are both familiar and strange, often pulling the veil between dimensions. She becomes the main character in each of her stories, and because she has ADD, she will get bored if she pretends to be one person for too long. Pauline is a horse trainer from Virginia, but writing is her therapy.Armored Hearts, her joint effort with author Melissa Turner Lee, has been a #1 Bestseller in Christian Fantasy and been awarded the Crowned Heart for Excellence by InDtale Magazine. Her debut novel, Sanctuary is scheduled for release September 30, 2013, and has already been nominated for two awards in YA Science Fiction. This entry was posted in Books, Friday Fascination and tagged C.J. Burright, Chronicles of Steele, fantasy, Pauline Creeden, Raven, steampunk, Wonderfully Wicked, young adult. Bookmark the permalink. 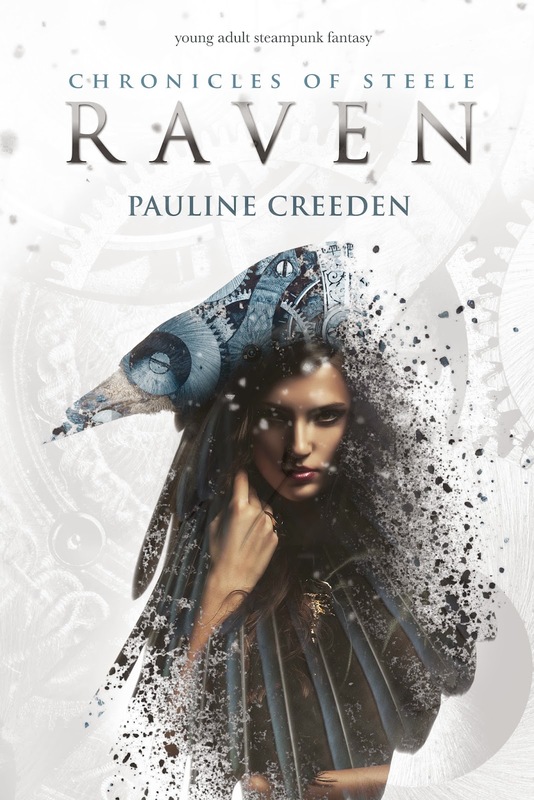 2 Responses to Raven by Pauline Creeden! I really like the cover for this book and am looking forward to reading it. I’ve added it to my growing list of TBR. Happy Halloween, Lori! I already ate my bag of candy corn…that stuff is downright evil. I love this cover too and can’t wait to read it. Thanks for dropping in!